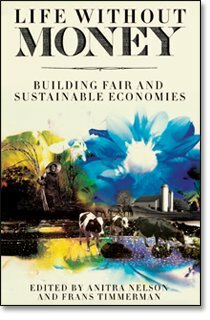 The new book Life Without Money; Building Fair and Sustainable Economies (co-edited by Anitra Nelson and Frans Timmerman) has just been released. The ten contributors to Life Without Money argue that we need to dispense with monetary values and relationships — yes, money per se — in order to manage our world on the basis of humane and natural values. The book brings together diverse voices with strong arguments against our money-based system’s ability to improve lives and prevent environmental disaster. It provides a strategy for undercutting capitalism by refusing to deal in money, and offers money-free models of governance and collective sufficiency. Life Without Money is written by high-profile activist scholars, including Harry Cleaver, Ariel Salleh and John O’Neill, and is an inspiring manifesto for those who want to take action. However, the book cannot be obtained »without money«, it has to be purchased in a bookstore. And the website indicates, that strict copyright applies. Creative Commons licenses are not used, which contradicts the aim of the book. Yeah. Kind of reminds me of the „Money Free“ online community, which chose to be hosted at Ning, of all places. London book launch of Life Without Money, with co-editor Associate Prof.